I wish I found this KAL earlier! I'm almost done, but I've had so many questions to get here.... I could have used your help. But now here I am, done with the shoulder parts, ready to sew them on -- Well, if I can figure out what the best way is. Could anyone post the close-up of the part where the shoulder meets the front? Please? My front rolls too. I hope it will be better when it's blocked, but I would like to hear from the other knitters how you fixed this. From the pace I knit, it won't be finished before the weekend -- I can only knit two hours a day, at most. I will come back with a finished photo! I used mattress stitch on my seams. 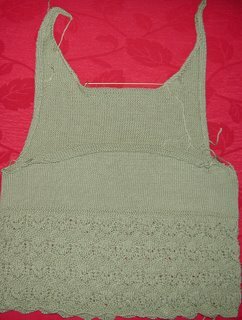 It is quite difficult to match the stitches up at first, with them being diagonal, but once I had got into a pattern it seemed to work out OK.